5 + = fourteen Required Please enter the correct value. Oil prices have had a volatile week. WTI oil gained 2.5% from Monday to Tuesday. By 10:30 a.m. today (Friday), the U.S. benchmark was down 0.4% to $59.01 a barrel. But that price dip shouldn't last. 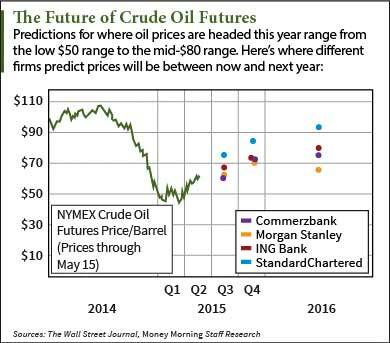 As this crude oil price chart shows, these major banks see prices rebounding in 2015. Some of them see oil surging to the mid-$70 range by the fourth quarter of this year. Futures were down this morning on a stronger dollar. Because oil is priced in dollars, it becomes more expensive to holders of other currencies as the greenback's value appreciates. The U.S. Dollar Index, which measures the dollar relative to a basket of foreign currencies, has risen 0.9% since yesterday. Despite today's drawback, the crude oil price chart shows that oil has stabilized in Q2 so far. The WTI crude oil price has gained 14% since April 1. According to The Wall Street Journal, most major banks see WTI closing the year between $70 and $87 a barrel this year. Brent crude oil, the global benchmark, is projected to be anywhere from $73 to $90 by the fourth quarter. Oil inventories will start falling significantly by mid-summer. ING bank – one of the most bullish analysts of the oil market – pegs the WTI oil price at $80 by 2016. The Dutch banking company asserts the high inventories are only seasonal. Oil supplies typically increase in Q1. That's when many refineries close down for maintenance. Money Morning's Global Energy Strategist Dr. Kent Moors sees oil at about $70 a barrel by Q4 2015. Demand is starting to outpace supply as oil firms cut back on expensive deep-drilling activity. The International Energy Agency (IEA) expects worldwide oil consumption to jump from 910,000 barrels a day this year to 1.13 million in 2016. "The most important [factor] is lower production in the face of continuing supply-side surpluses," Moors explained. "This will depend on the ability of U.S. operating companies to limit new projects of a certain type." Don't miss any oil price updates. Follow us on Twitter at @AlexMcGuire92 and @moneymorning.